SF Dog Connectors Meetups are held approximately every other month. Training tips & treats from The Pooch Coach! at Christopher Playground in San Francisco. 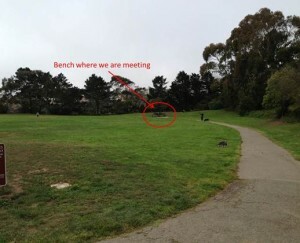 (Scroll down to see pics below for exact meeting location). The Pooch Coach, SF’s top rated dog trainer & behaviorist, will give some demonstrations and offer 1-1 help to attendees with questions about their dogs. Please be on time so you do not miss the exercises! We will continue the exercises of walking our dogs by other dogs to practice calmness & not reacting. 12:20 – 12:45 One-on-one coaching for Pooch Coach Clients only. Click here for more info and to sign up on Facebook, or click here for Meetup.com..
Come out and enjoy some fun play time with your dog. Meet other dog lovers and get training and behavior tips from expert San Francisco dog trainer & behaviorist, The Pooch Coach! If your dog is a little shy, don’t worry! I’m here to help. We can all work together to teach our dogs great manners around other dogs and all types of people. Let’s demonstrate responsible dog ownership and help keep our parks available for our dogs to play. This is not an official off leash park, but most people do let their dogs run off leash. Glen Park Canyon is right there, so you can also go on a great hike from here! There should be plenty of parking in the Safeway/Walgreen’s parking lot. 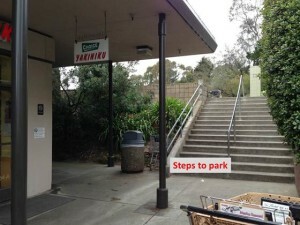 Just walk up the cement stairs off the to right corner of the mall and the park’s right there. (See pics below for details). 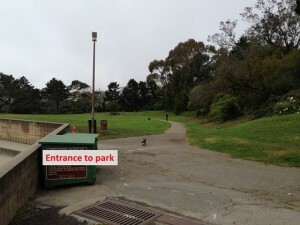 Or, park on the street on Diamond Heights Blvd – there’s an entrance there as well. Here is a video sample of a previous Meetup, where The Pooch Coach explains how to keep your dog from jumping on people to greet them. 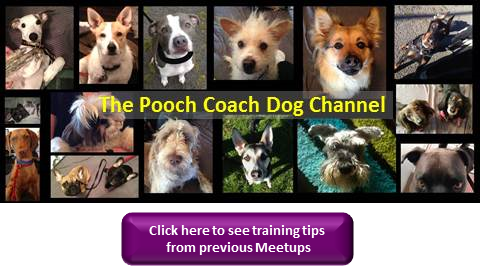 DOGTV has covered our Meetups in their blog.